Did you know that Pokémon is the highest-grossing video game franchise of all time? It’s true—according to Wikipedia, the Pokemon franchise has grossed USD70 billion from 1996 to 2017. So there’s no question whether there’s market demand in the ‘collectible digital creatures that you can train, breed, and battle’ space. Pokémon proves it. Of course, the problem is that with so many iterations of Pokémon games, you cannot bring your beloved Pokémon across versions. Obsolescence also guarantees you will eventually lose your previous Pokémons (how many people still play with their Gameboys?). Enter Axie Infinity, a game which can be best described as a more complex version of Pokémon, except it’s on the blockchain, meaning your ownership of your Axies is irrevocable. This introductory guide will look at the basic mechanics of this sophisticated game, its core appeal, and where it’s headed. Before going into game mechanics, let’s understand how it’s even related to blockchain in the first place. Each Axie is a non-fungible token (“NFT”), existing on the Ethereum blockchain using the ERC721 standard. For more on NFTs, please refer to this article. You can think of Axie Infinity as an evolution of the popular CryptoKitties game. While in CryptoKitties all you could do was own and admire them, in Axie Infinity, you can do so much more. A major part of the addictive power of video games is levelling up. Even when the process it’s tedious, we still do it. A game that doesn’t have any progression system won’t go very far. In Pokemon, you could level up your creatures, which earned them new abilities and even forms through evolution. Axie Infinity sticks to this basic model, but with a twist: instead of evolving the whole Axie, you can evolve specific body parts instead, which adds new moves to its arsenal and increases its overall stats. Taking a page out of the Tamagotchi playbook (remember those? ), you also have to care for your Axies. Each Axie lives in its own Terrarium from where you can clean and feed your Axies and put them to bed. When Pokemon introduced its breeding feature with its Gold and Silver versions in 1999, it was a huge hit. Axie Infinity has incorporated this feature with its Axies, but unlike Pokémon, you can breed any two Axies with each other (just no siblings or parents) no matter which species they are. The Axie offspring take their base stats from their parents, but there’s always a chance the process may unlock an entirely new class in the offspring. You don't need to only breed your own Axies; you can also breed with other players’ Axies through a feature called the Axie Mating Club. What fun would it be to have badass creatures that can level up and learn new moves if you can’t battle with them? Axie Infinity uses a 3v3 turn-based team battle style, and one big point here is that each Axie will use its moves in a certain preset sequence. Axies also have six different classes, and just like Pokémon, classes have their own strengths and weaknesses against each other. 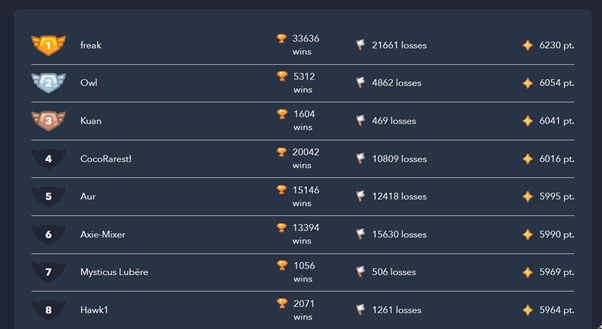 Once you have your team ready, head to the Battle Lobby to find some opponents! Buying and selling Axies can be done through the Axie Marketplace. As Axie Infinity runs on the Ethereum blockchain, all prices are quoted in ETH. As of this writing, there are over 1,700 Axies available for sale on the marketplace with prices ranging from less than 0.02 ETH to over 100 ETH. 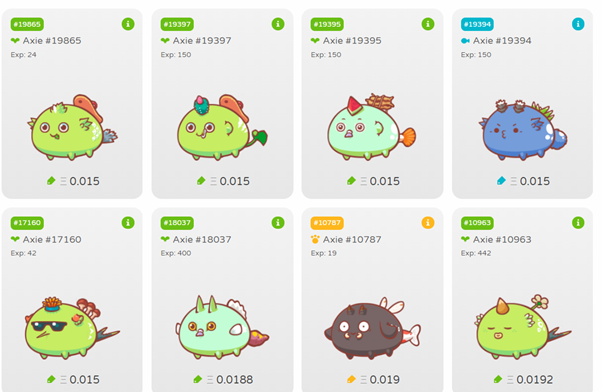 If you were wondering what could possibly justify a price tag of over 100 ETH for an Axie, these are all ‘Origin’ Axies; Axies that were created in the original presale back in February 2018 (the presale raised 900 ETH) that have body parts which may never be seen again. Now that we’ve looked at the main appeal of the game itself, let’s look at its business model. How do the developers make money? Currently, the developers take a 4.75% cut out of all sales in the Marketplace and breeding fees in the Mating Club. From time to time, they may also auction off special unique Axies, called Agamogenesis Axies with special colouring and body parts. As the game matures, the developers also hope that they will be able to earn additional revenue through esports and brand licensing. 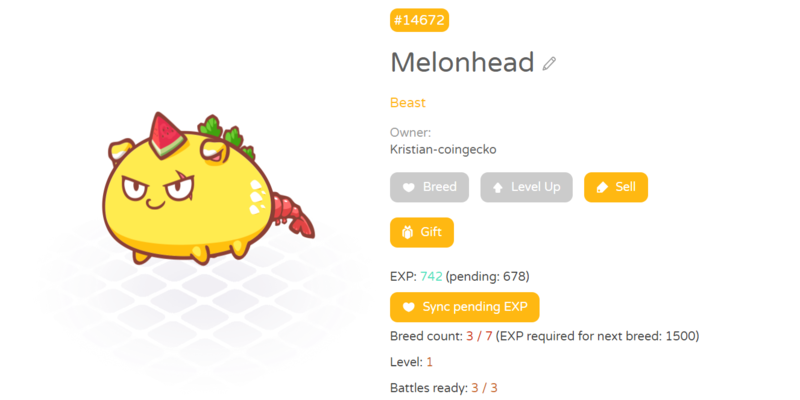 Like many dApps built on the Ethereum network, you’ll need to use MetaMask to play the game from your desktop. 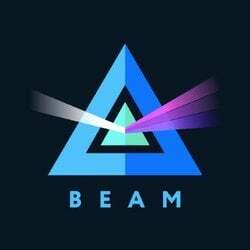 If you’re on mobile, you can use Coinbase, Trustwallet, or Enjin instead. Once you’ve logged in with your wallet, head over to the Marketplace and get your budding Axie team started! For those who don’t like to use MetaMask for whatever reason, the developer team has said that they are working on providing alternatives for easier onboarding. Development of Axie Infinity has progressed quickly, from a presale in February 2018 to its battle feature going live recently. According to its official roadmap, terrarium presales will be hitting the market soon, and by the end of 2019, they should have an official tournament circuit, player achievement systems, story and dungeon mode, guilds, and a mobile app. The basic framework that Axie Infinity is following is nothing new, but it is proven. By adding a few twists to the Pokémon model and integrating it with blockchain, Axie Infinity has created a fun and captivating game that is the first of its kind on the blockchain. Still in its early stages, its future developments could propel this game into a full social experience that has the potential to go viral. In particular, the launch of Axie Infinity’s mobile app is something to look forward to, considering that the mobile gaming market was worth USD70 billion in 2018; just over half of the entire gaming market. 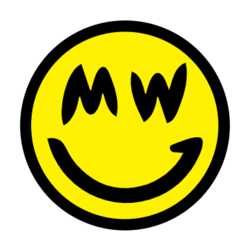 From a broader perspective, it will be interesting to see how this and other blockchain games fare as cryptocurrencies continue to mature.